had a wonderful day off yesterday - the weather is amazing at the moment - sadly probably global warming! but i visited two exhibtions and went to see massive attack in concert in the evening. 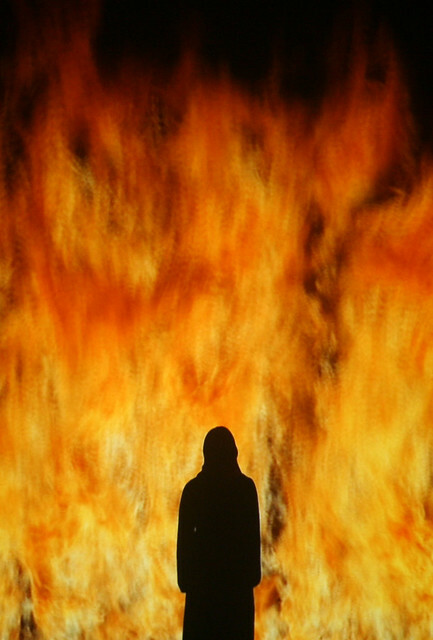 one of the exhibitions was life death rebirth with bill viola video installations and michael angelo drawings. i'd actualluy seen a lot of the viola installations at various exhibitions over the years but it is amazing. i am convinced my heart rate was slower when i came out - i think we took getting on for a couple of hours going round. his work is very spiritual drawing on religious themes. i found the curators comments next to some pieces quite annoying though! one of things that was strange was how the view of spirituality seemed to buy into a negative view of the world and the notion of getting the soul out - it's kind of a platonic view of the world that has informed some bad what i call escaplogy theology over the years. the worst case of it was next to a drawing by michael angelo of the resurrected christ which was a really great drawing of a body bursting out with energy and the curator had sai something like a suprising embodied drawing of the resurrected christ - duh! what exactly did you think the resurrection is if not a body???!!! anyway that aside it is a fantastic exhibition. this photo is of the piece fire woman which is amazing - possibly my favourite piece. of course there are no photos allowed by i took this photo years back at an exhibition where i got thrown out for taking photos which is the only time that has ever happend to me. massive attack were great as ever - i have no idea how many times i have seen them - a lot! but just as in the manchester international festival adam curtis was doing the visuals. it was a wide ranging set of visuals of life in our crazy world - once again he was opening up the idea that we are stuck in our own past rather than able to imagine a different future as we are fed things based on feedback llops - you like this so you'll love that. one memorable sequence was a series of projected slogans from politicians that sounded great in their own right but when projected together came across as hollow slogans which is what we have got used to. it was pretty bleak... but i found it also woke me up - it's so easy to be numb. it's so great living in london!